When we first moved to Milwaukee, we got two pet rats from the Humane Society, Ruby and Perl. Kacy already had rats before, and I liked them and other rodentia, so it was a good fit for an apartment. Perl passed away from a respiratory infection a few months later. We were out at the pet store a few months later, and were greeted by one rat with a big yawn and "what's up?" kinda look from inside the cage. We ended up bringing Opehelia home that night (on the bus, no less). Today we had Ophelia (Fifi) put to sleep. She's been sick for a while, and basically riddled with arthritis since shortly after we brought her home. Steroids would sometimes work, and sometimes not. 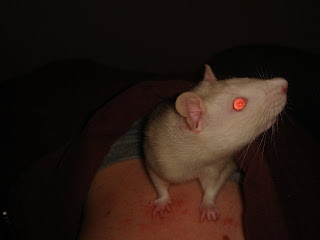 She hardly had use of her back left leg, and developed a tumor as well (common in rats). She was always eating and constantly losing weight, and so we finally had her put down this morning. 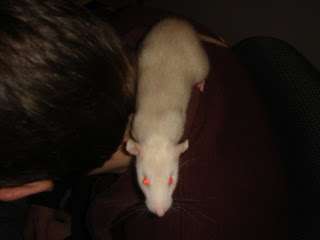 This was definitely my rat- she would sleep on my neck or in my hoodie, ran to me to hide from the vet, and even layed against me last night as we let her out on the bed for the last time. This was destiny, though; she had an hourglass pattern of white fur on her stomach. I'm gonna miss her... but it's better than limping around as she was, and being trounced over by Brother & Sister. After we lose those two, I think we're upgrading to cats.